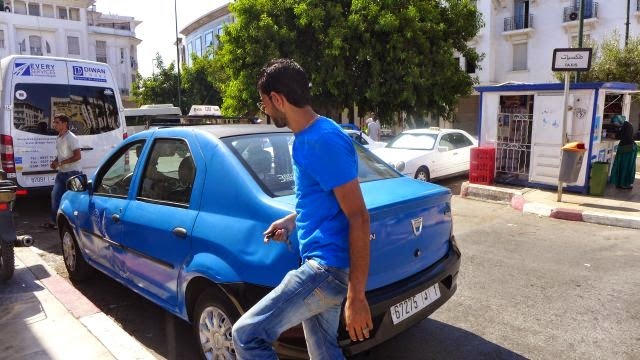 As mentioned in the previous post, we managed to get a private grande taxi for MAD 250 (RM 93) from Imlil to Marrakech train station. The driver, like the first taxi driver also drove really fast so we buckled up although sitting at the back. 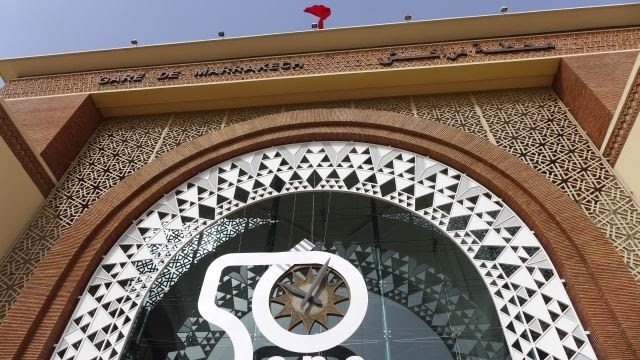 We departed from our riad at 8.30am and arrived at Marrakech train station at almost 10am, enough time to buy the ticket to Rabat scheduled to depart at 10.45 hrs and arrive at Rabat Ville at 15.10 hrs. 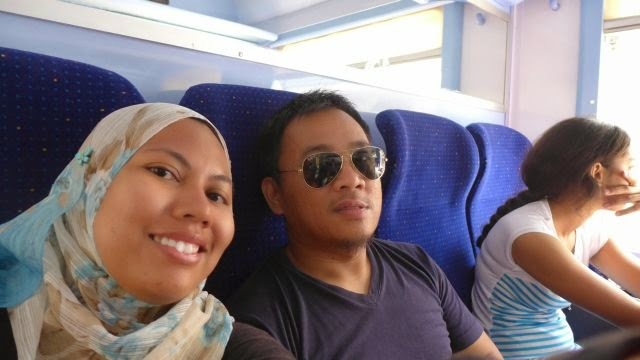 Our train ticket for second class (free seating - first come first serve basis) costs MAD 120 (RM 45) per person. Based on our internet search, we cannot buy the ticket online so we bought it at the train station. For second class tickets, there are 8 seats in an enclosed cabin where the aisle is by the side of the cabin. The train is air conditioned, but since this is summer it did get stuffy in there with excess passengers who couldn't get seats. 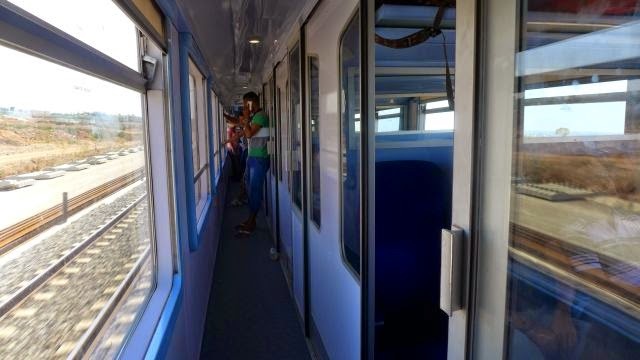 Apparently, the railway company ONCF, sell unlimited tickets for the second class as we saw many passengers who boarded the train from a later station standing, including families. 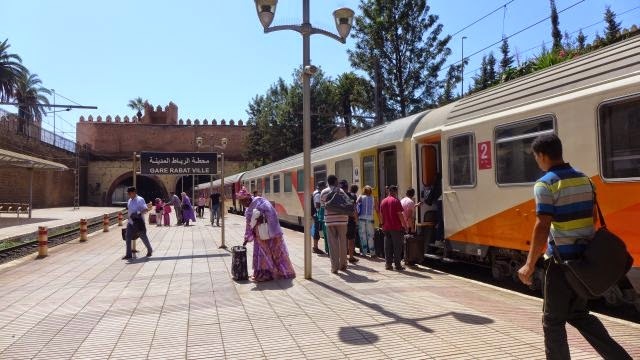 Since Marrakech is the first station for the train bound to Tangier to the north east, we managed to get seats. 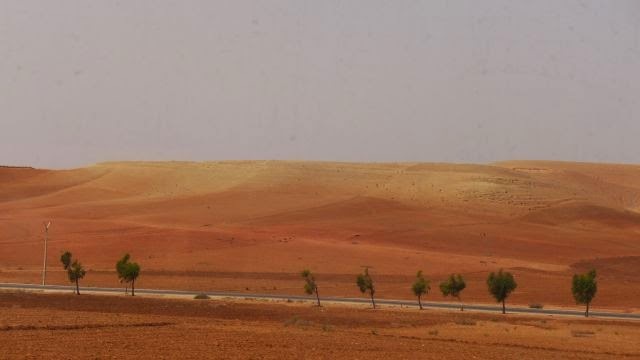 The view along the way was of the North African desert terrain with the occasional planted trees (possibly argan and olive) and the abundant cactus. 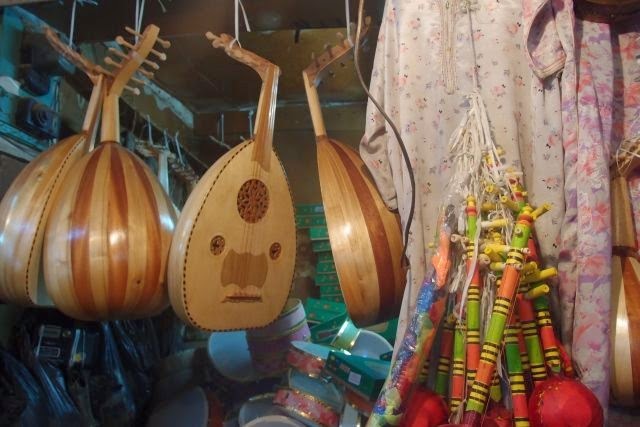 Cactus are also sold as fruits at the stalls in Morocco, but we didn't try any. 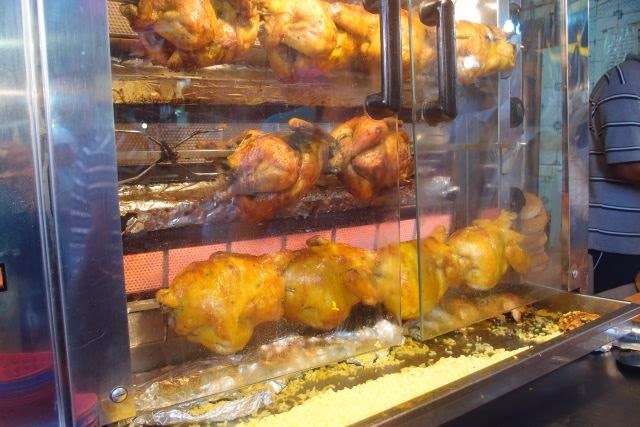 If you get hungry, do not worry. 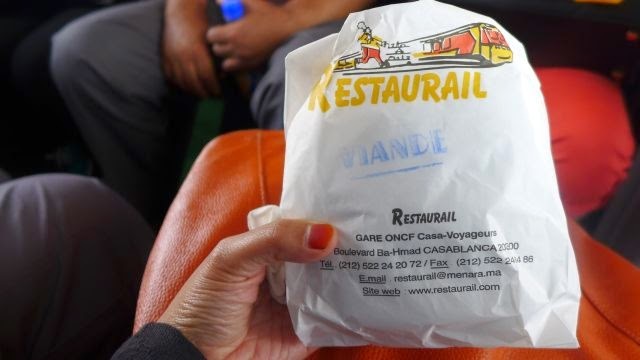 You can buy drinks and sandwiches from the restaurail where the railway staff pushes his cart from time to time, just wait for him to come by. We bought an orange juice (MAD 15 or RM 5.60) and a beef or viande sandwich (MAD 20 or RM7.50) . 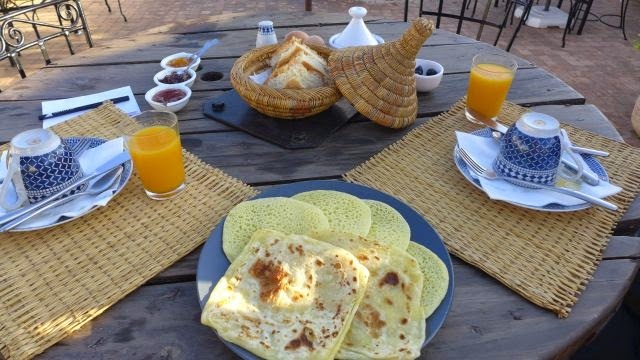 It was quite tasty and filled our tummy until we reach Rabat. Word of caution though - there is no announcement on the next station of arrival. Therefore, you must be alert and always on the look out on the stops near the expected time of arrival at your destination. 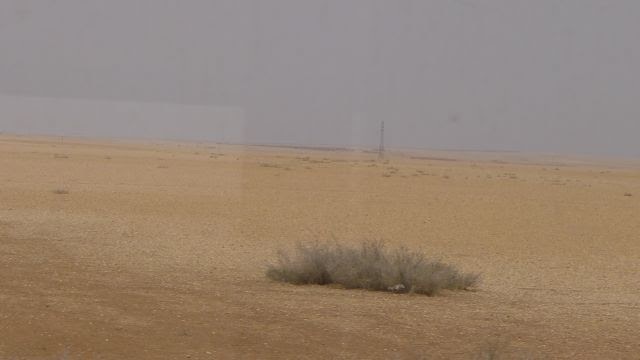 For us, we asked the local people around us, who fortunately could speak English and told us when to alight. 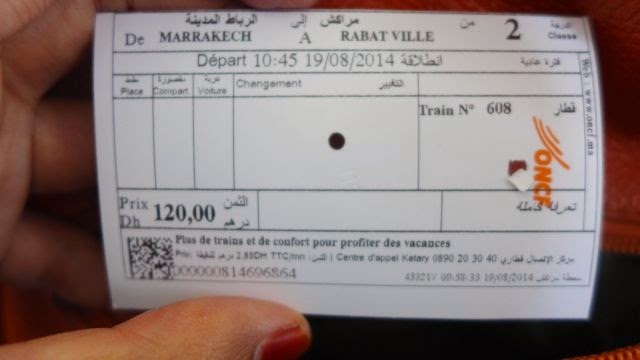 We arrived Rabat Ville station as per schedule. 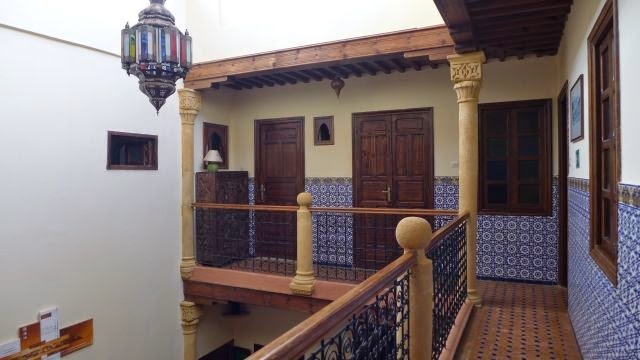 We had received an email from our riad on the directions to there, where to get a taxi and how much it would cost. So this time we knew what to expect and could avoid being cheated. 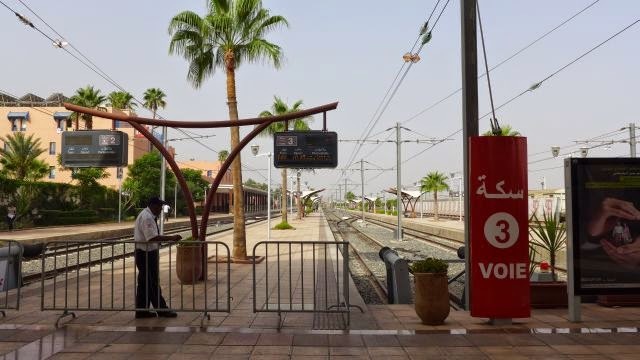 Before we took the taxi, we posed for some pictures at Avenue Mohammed V just in front of the train station. 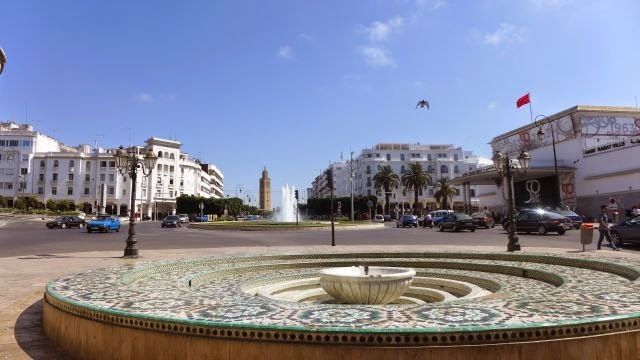 Rabat is the capital of Morocco (not the more famous Casablanca - because of that movie or the charming Marrakech). 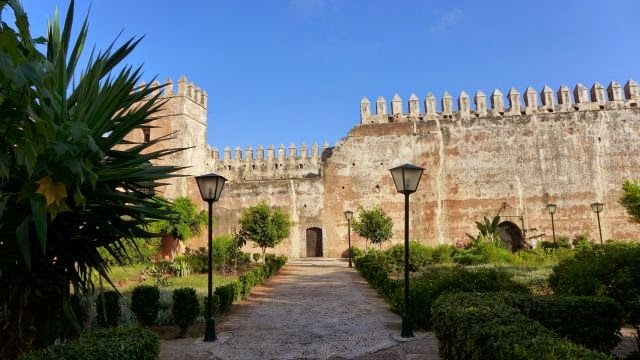 Why we decided to go to Rabat and skip Casablanca and Fes, apart from time limitation was because Rabat has a few features all rolled into one - it is located at the coast of the North Atlantic Ocean, it has an archaeological ruin site (Chellah necropolis), Medina, and a Unesco World Heritage Site. 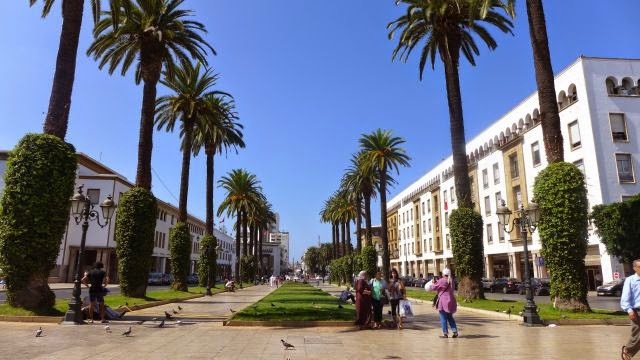 Of course, being tight on schedule, we had to pick a city that is within the route to Tangier. Another interesting city, Fes required a detour and so needed extra time to make the journey there and back to the north east bound line. 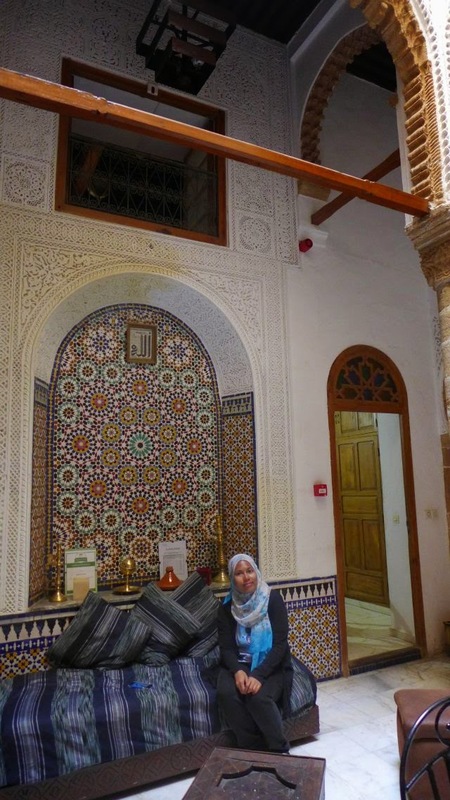 I'd definitely go to Fes (and Meknes which is on the way to Fes) if I have the opportunity to go to Morocco again. 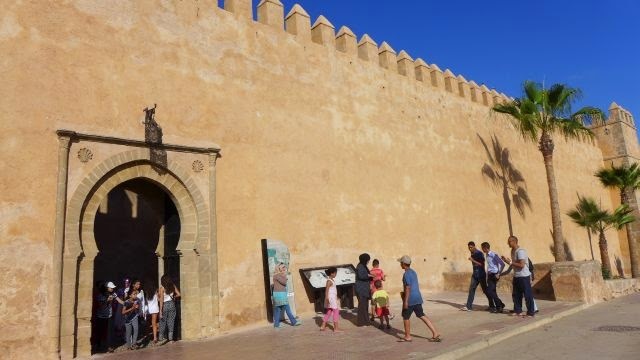 After taking pictures at the Avenue, we walked back to the train station, took a petite taxi and asked to go to Avenue Laalou, near to the Kasbah des Oudayas. We were charged about MAD 18 (RM 7). Ah, finally some peace of mind knowing what we were in for. 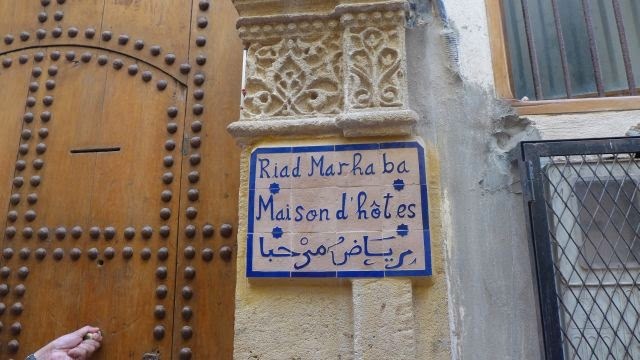 From the Avenue Laalou, we asked around to find the Rue Jirari, a narrow lane leading us to our riad. We managed to find it and were greeted by friendly Amine at the riad. As with the custom in Morocco, we were welcomed with a Moroccan mint tea, this time at the rooftop terrace (no mountains here though). 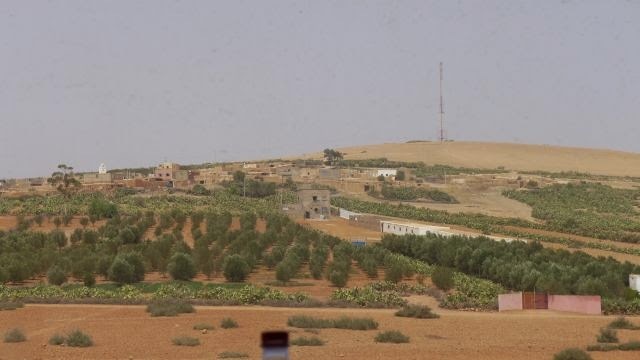 Amine then briefed us on the places of interest in Rabat and how to get to the places, all within walking distance. Even the train station actually, but it would be easier minus the luggage. 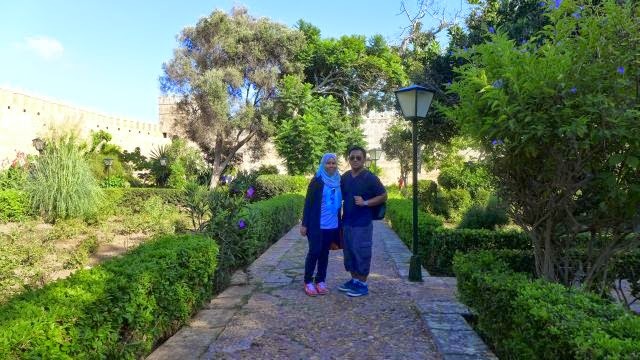 Amine is well versed in English and also other languages - French, Arabic, Spanish, Italian etc. 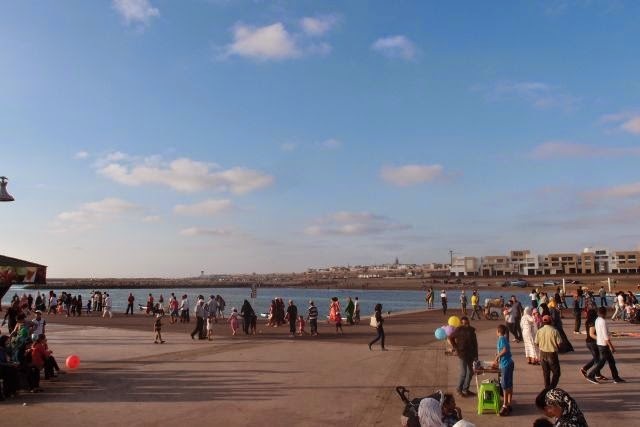 Something we noticed in Rabat is the modernity. Perhaps this was because we skipped the Ville Nouvelle in Marrakech. 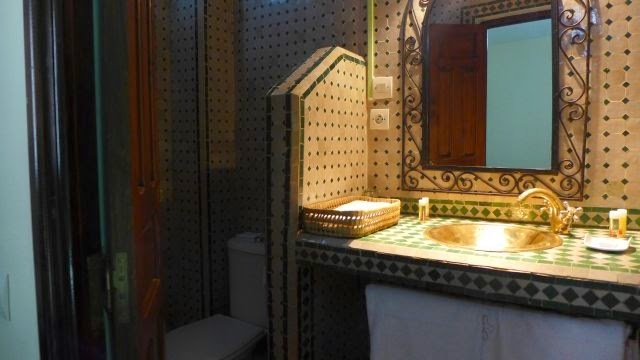 Also, accommodation is much expensive in Rabat. 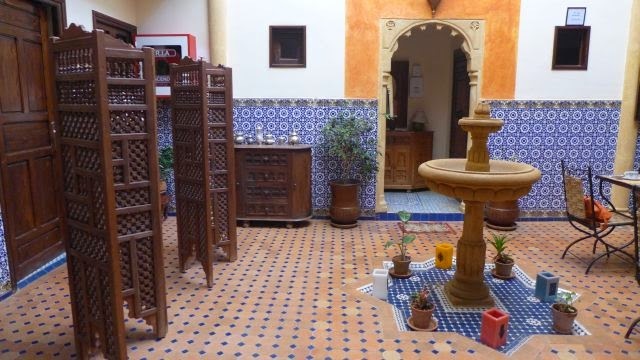 Our Riad Marhaba in Rabat costs EUR 55(RM 215) per room per night , including city tax at EUR 2.5 / person / night (the cost of 2 nights in Imlil and almost twice the price in Marrakech). 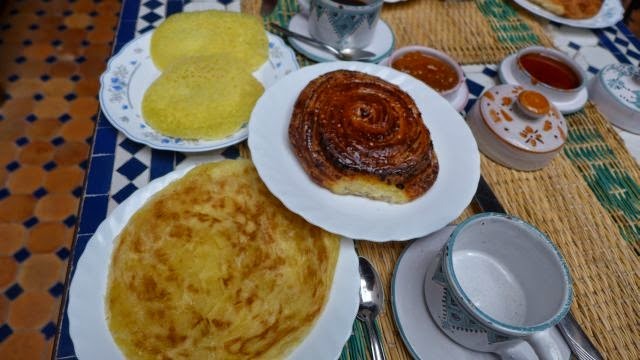 The price also includes breakfast, which was served at the rooftop. 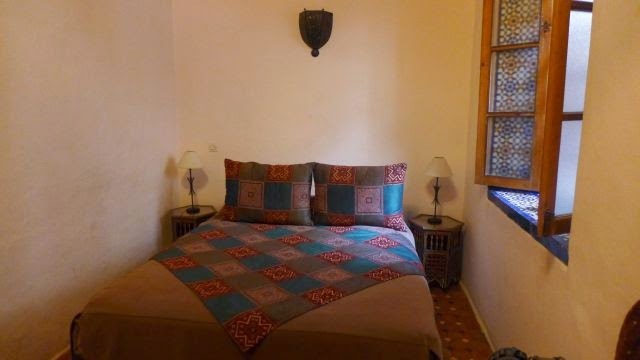 We booked for 1 night only at Riad Marhaba as it was fully booked. 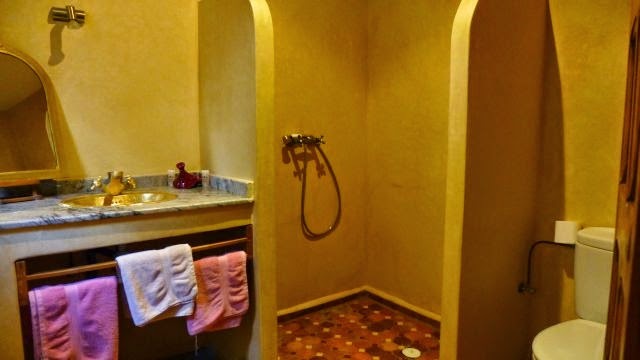 We would be moving to the nearby Dar Yanis which also cost the same. 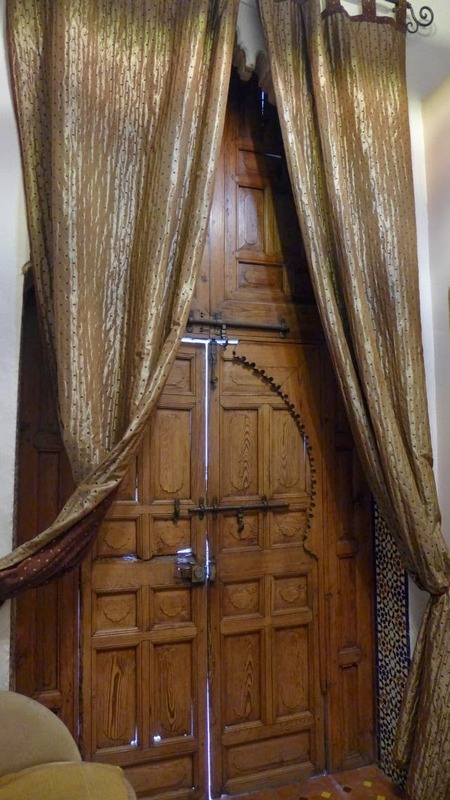 However, Riad Marhaba only accepted cash while credit card payment is possible at Dar Yanis. 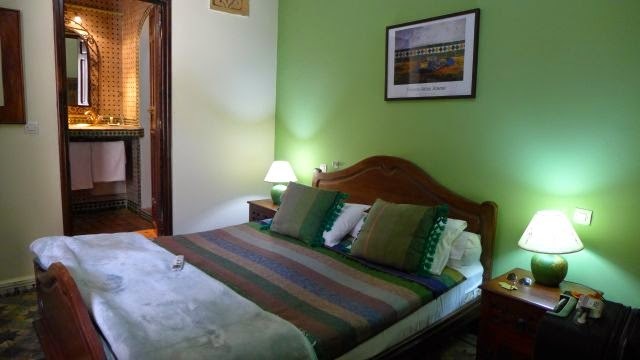 We found that Dar Yanis is more strategically located, just next to Avenue Mohammed V and just a straight forward walk to the train station. 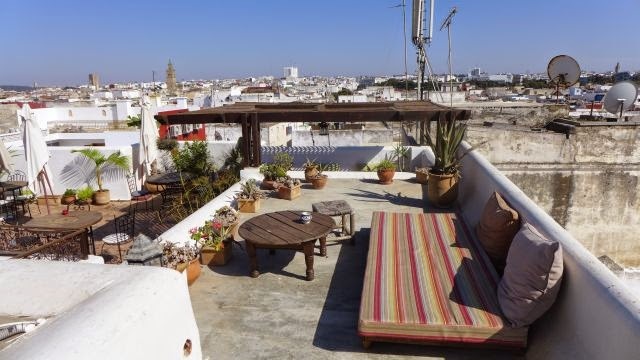 So if you're looking for a riad in Rabat, we'd reckon Dar Yanis due to its location. 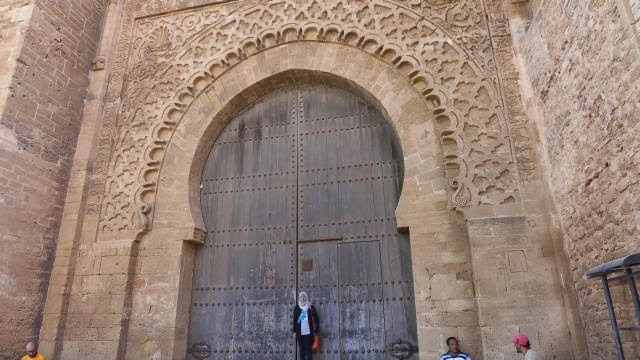 After resting and freshening up, we made our way to the Kasbah des Oudayas, only about 10 mins walking (650 m) away. 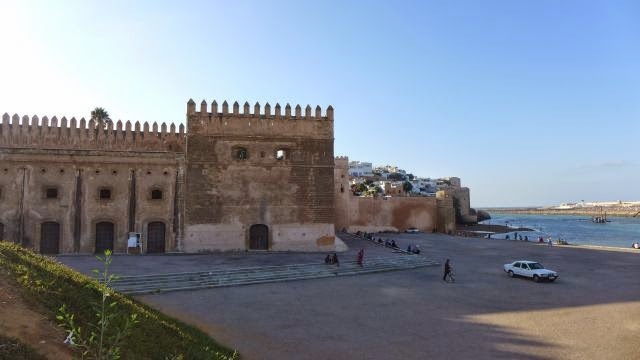 Kasbah des Oudayas is a fortress by the river mouth of Bou Regreg flowing into the Atlantic Ocean. 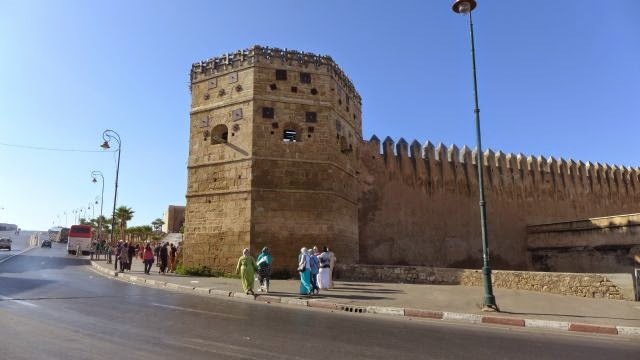 It was built during the reign of the Almohads. 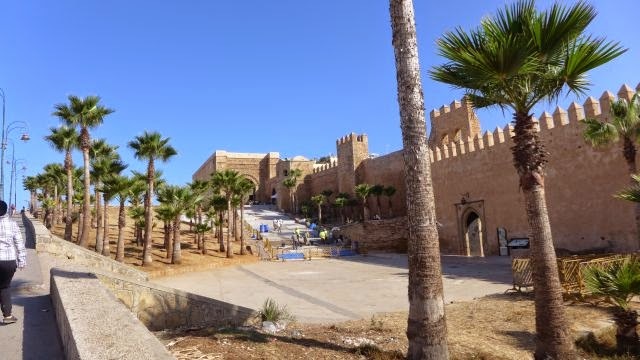 When the Almohads had captured Rabat and destroyed the kasbah of the Almoravids in the town, they began reconstructing it in AH 544 / AD 1150 (excerpted from Wikipedia). Entrance is free. 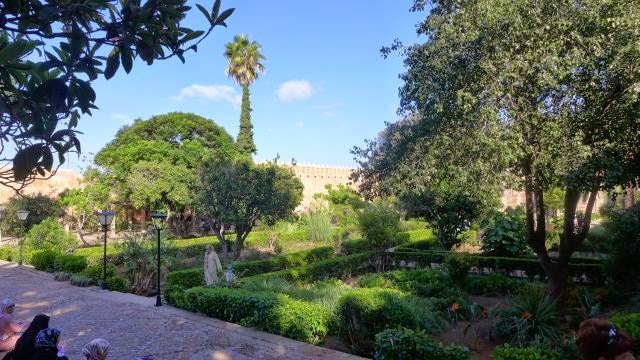 There is also the Andalusian garden next to the Kasbah which we paid a visit and took pictures. Entrance is free. There is also a funfair by the River Bou Regreg. 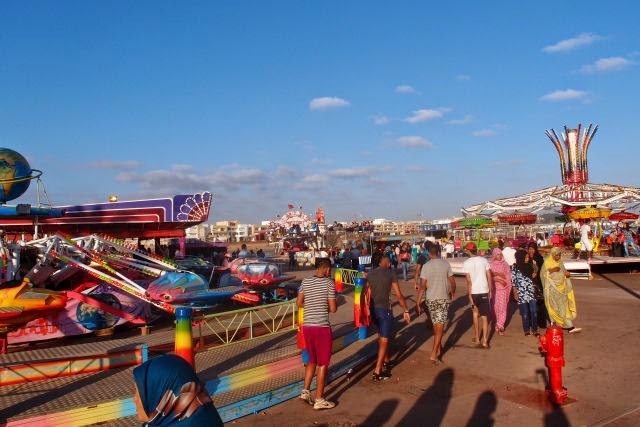 Families and young people throng the area as it was during the summer holiday. Water sports such as jet skiing is also available here. Locals also swim here at the river mouth. 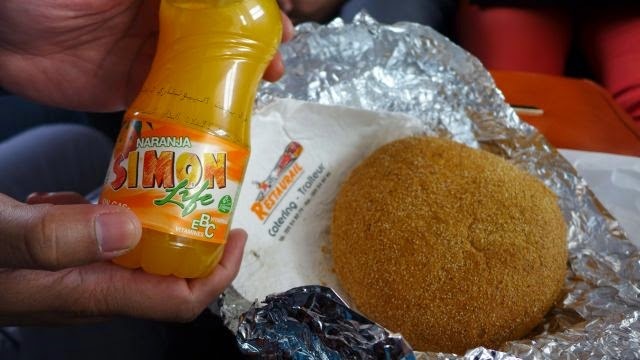 We were then feeling hungry as our last meal was the shared sandwich on the train. 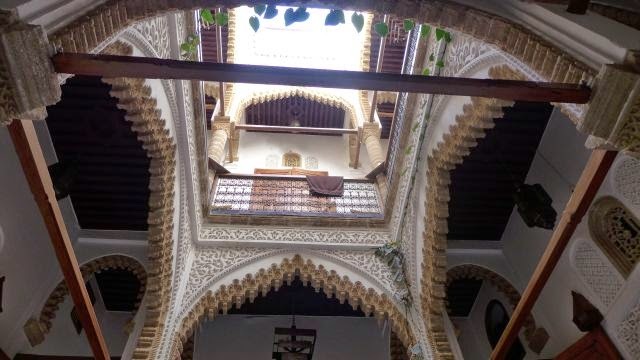 We made our way back to the medina where our riad is. We followed the map given by Amine via the Avenue Souiqa. 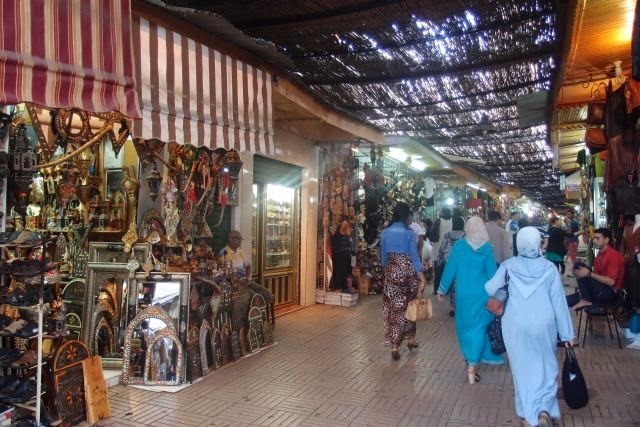 As the name suggests, this is the main street of the souk. 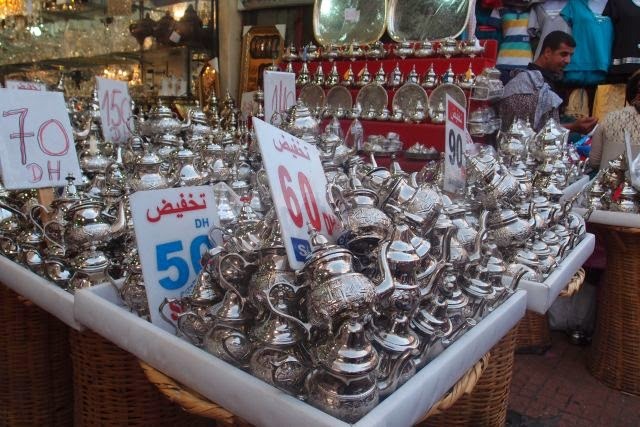 Like Marrakech, but less extensive, a variety of goods are sold here. Tonight we had a huge portion of chicken (poulet) with rice and fries for only MAD 45 (RM 17) . 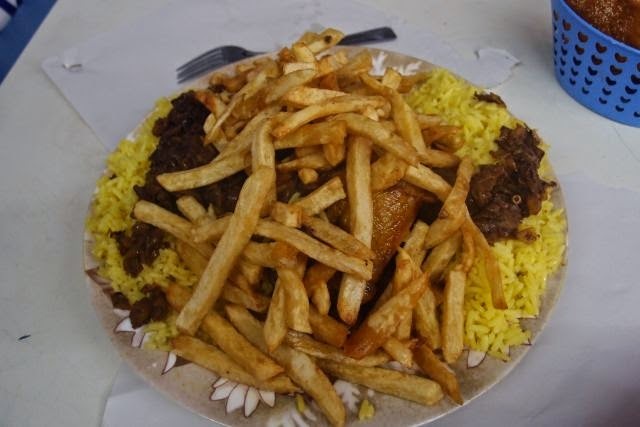 It was delicious, plus we were already very hungry. 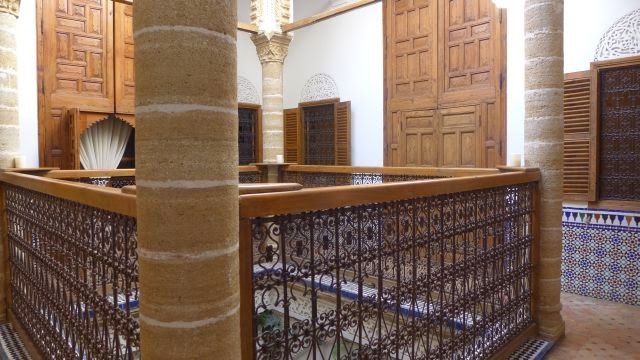 After dinner, we tried to make our way back to our riad via the medina but it was not possible as the narrow lanes were filled with people to the brim. 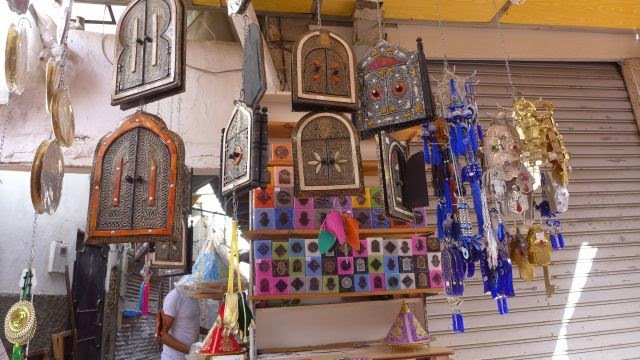 So we made our way to Marche Central, walked via the main road Avenue d Egypte and back to Avenue Laalou into Rue Jijari. Walking outside the medina is further but it was too crowded and was impossible to move inside. 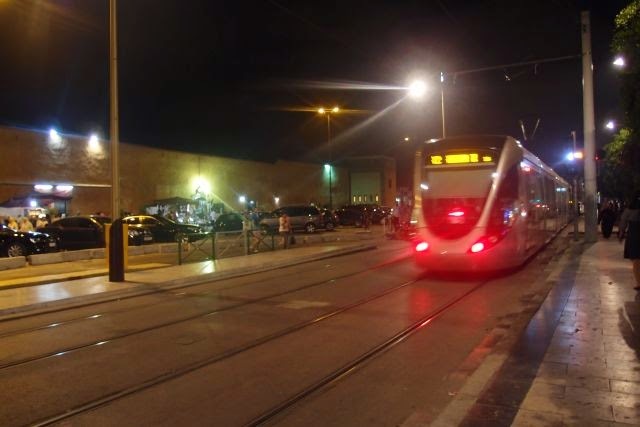 We passed by a tram line at the main road, another sign of modernity in Rabat.